Send later from Gmail using Boomerang! 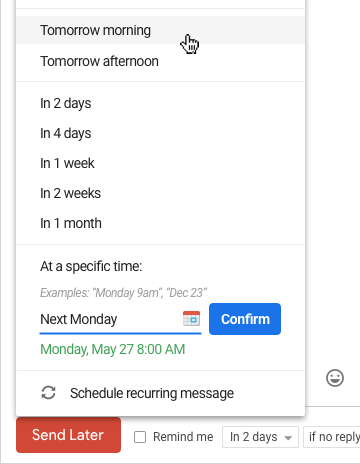 With the Boomerang for Gmail extension, you can schedule an email to send later at the time you choose. 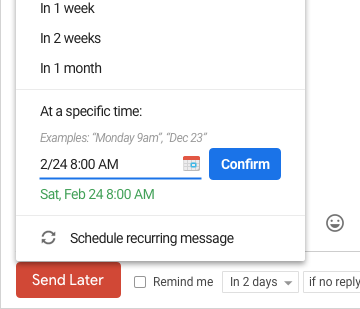 Boomerang's popular “Send Later” feature makes it easy for you to schedule an email to be sent at any time you choose. You can draft your email now, then schedule it to be sent automatically at the perfect time. Just write the message as you normally would, then click the Send Later button.